Picture a movie that has a mother praying to God to restore her dead sons, God actually doing that, and the sons then avenging their death in their previous birth. Sounds like a Ramsay flick, or, in any case, one that was made some 30 years back, right? With a story line like that, Karan Arjun became one the biggest hits of the nineties, frustrating again all theories being formulated about audience behavior. One of the reasons was the star cast. 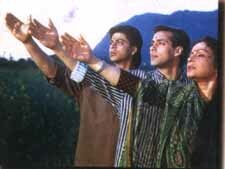 Karan Arjun brought together for the first time on screen, the superstar Khans - Shahrukh and Salman. Then, the music was tops - Jaati Hun Main and Ranaji Maaf Karna are just two songs from the film that were runaway hits. A typical Hindi masala movie with loads of action and song and dance sequences, it was the treatment, the script and acting that made Karan Arjun better than the rest. The story kicks off in rural India with brothers Karan (Salman) and Arjun (Shahrukh) and their loving mother Durga (Rakhee) living a content life as a happy family with a missing father. But soon it is revealed that the brothers are the only grandsons of the rich Thakur who, under the influence of his evil nephew Dhurjan Singh (Amrish Puri), had disowned his son for marrying the poor Durga. The old man on his deathbed is repentant. Durga tells her sons that the evil Dhurjan killed their father, and heads off to meet their dying granddad. Dhurjan spoils the happy reunion - he murders the Thakur and, with the help of his brothers, brutally kills Karan and Arjun. Disillusioned and angry, Durga invokes the might of the Goddess Kali and pleads for the reincarnation of her sons. Twenty-five years pass by and Durga's prayers are answered. Karan is reborn as Ajay, a professional street fighter with paramour Mamta Kulkarni, and Arjun is Vijay, an able stable hand in love with Kajol. Kajol happens to be betrothed to Dhurjan's son, and when she is forcefully taken away to Dhurjan's village, Vijay follows with friend Lingaiah (Johnny Lever). On arrival, everything seems familiar, and eventually he meets Durga and his memories come back. He finds Ajay, and after a bit of convincing, his memory is refreshed too, and the stage is set for the final confrontation. Like we said before, there is nothing new, but the controlled performances from Shahrukh, Salman and Rakhee, and a great music score, made Karan Arjun the hit that it was. It is not easy to handle two superstars, but Rakesh Roshan did great job of it, and was gifted with a movie that ran for over hundred days. Be the first to comment on Karan Arjun! Just use the simple form below. fullhyd.com has 700,000+ monthly visits. Tell Hyderabad what you feel about Karan Arjun!